I’m so tired. Husbandman is exhausted, too. It doesn’t help that he started a master’s degree less than a month after Cora died. It doesn’t help that we’ve started attending a new Bible study, are both back at work full time, are working our butts off to get out of debt (Dave Ramsey style), or that I’ve gotten a dream opportunity to teach a class for undergraduate students to help them build their professional skills before they graduate. Tired. 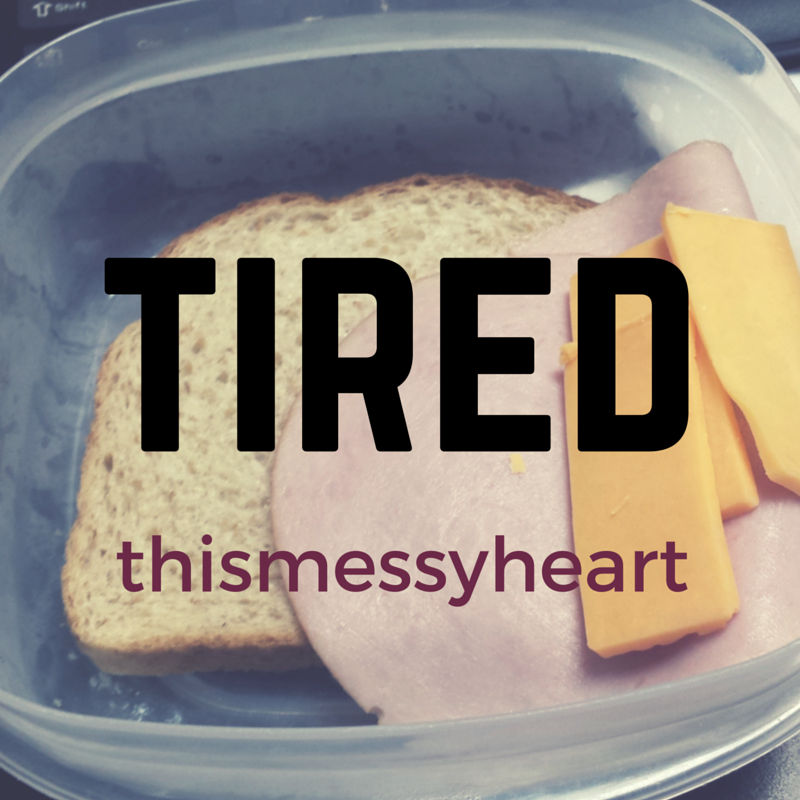 Like half-done lunch meat sandwich tired. The poor man had forgotten the top piece of bread. When someone that you love who is mourning is tired, encourage them to rest. Encourage them to put Facebook up at night and close eyes. Encourage them to take quiet time when their lives get hectic. Ask them to do things with you that involve rest. Don’t be offended if they tell you that they’re “too tired” to do something with you, because this grief thing is physically difficult. May we encourage one another to rest in Christ and cease our striving whether we’re tired because of grief or another cause. The last three months, I have cried more than I thought possible. This is no mean feat. Psalm 56:8 says “You have kept count of my tossings; put my tears in your bottle. Are they not in your book?”, I really feel like God has buckets for me. I cried a lot when we got home from the hospital, and the tears have come a little slower every day. I no longer choke every time I have to tell someone that Cora died. I no long cry every time I see the car seat my sister bought her. I cried this week when I drove past Penn Station, because I craved their french fries even when I was going through morning sickness. I cried when I realized that I’m just two weeks from her due date. When someone that you love loses someone, or when you lose someone, let crying happen if it needs to. Don’t feel bad if I cry when I’m talking to you. Don’t feel bad if you case a crying fit. Also, don’t feel bad if you don’t have a whole lot of tears. Do what feels natural to you as you work through your grief. What do you think about tears in mourning? Are you a crying? Are you not a cryer?